Let the #1 name in typing for 12 straight years guide your typing tutorials. 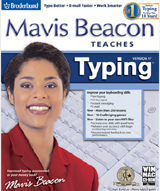 Mavis Beacon offers continual challenges with performance-based programs that adjust to your skill level and provides instant feedback on every exercise. Don´t waste valuable time hunting and pecking your way around the keyboard. Improve your keyboarding speed and accuracy and watch as your efficiency and performance increase. Comments: This is better than the last version. This program/game has helped me to improve my keystroke and speed. Just by doing the things it says while being fun as well. If your trying to learn to type or get your speed up this is just the thing to help you. Plus everyone in your family can use it as well.